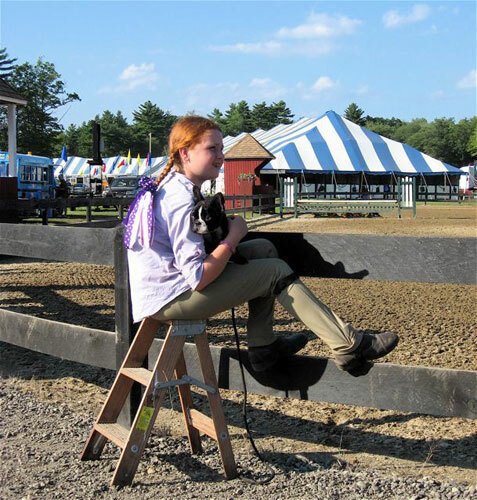 Home › Blogs › Dog and Pony Show – Is Your Pup Prepared? It’s show season!! Hurrah, Hurrah! How can you disappoint the cutest dog in the world? While it may be hard to leave him home, ask yourself if you really should bring him or her on a long and busy show day. The answer is “yes.” And “no.” And “maybe…with some important qualifiers and advance planning.” Let’s sort it all out and see what’s right for you and your canine companion. First, evaluate your dog honestly. Is he comfortable being around horses in motion or does he lunge, bark or hide? While he may be fine with a horse quietly grazing, how would he be next to a warm-up ring with 10 horses trotting, cantering and jumping just a few feet away? How does she react to strangers (human and canine) and excited children invading her space? Does your dog play well with others? Is he social with new dogs or confrontational? Can she wait quietly for you while you ride or does she bark and whine incessantly when you are out of sight? Horse shows are no place for overly stimulated or fearful dogs, nor are they the place for on-site sensitization and obedience training. Don’t despair, If your dog isn’t quite ready to join you at the next show, that doesn’t mean you can’t prepare him for one later this season. Start today and stick with it! If he’s not comfortable around horses, you may want to start by reading our last blog. If he has an aggression or anxiety issue you should seek the help of a professional, experienced trainer in your area who can get you on the fast track. Do it right and reap the benefits. Most of us devote hundreds and even thousands of hours training our horses, but we think our dog’s training stops at “sit” or “stay.” Even if you don’t think your dog is ready now, keep reading so when he is prepared for the big day, you are too! Congratulations! Your dog passed his evaluation! Now on to the horse show. But whoa there, before you make promises you can’t keep, be sure to familiarize yourself with the show’s rules, and each show is different. 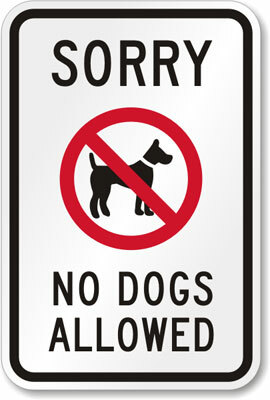 Are dogs allowed on the grounds? You can’t assume that they are. Read beyond the class list for text like “Due to insurance regulations and liability, we are no longer able to allow dogs at our horse shows.” Or this: “We love your dogs too, but we ask that you leave them home!” Or “Local animal authorities will remove loose dogs at the owner’s expense.” And “Dogs in distress left in cars, trailers etc. will be removed at the owners expense.” If your dog IS welcome, remember, his behavior could directly impact that show’s dog policy in the future. Don’t be the one with the dog that ends up in the doghouse! Next, it’s time for a pre-show site inspection. Take your dog…it will give him a chance to leave some pee-mail for his future horse-show friends! If seeing it in person isn’t a practical option, ask people who may have already shown there what the parking situation is like. Most show sites have limited shade so, you may need to leave twenty minutes earlier than usual to score a prime parking spot where your dog is safe and protected from the sun and commotion. Now start paying close attention to the weather forecasts. Is your dog a breed that is predisposed to heat stroke? (Boxers, pugs, bulldogs, Boston terriers & many others.) How hot will it be mid-day? Use extreme caution for ALL breeds if the forecast predicts a scorcher. Or better yet, do your dog a favor and leave her home that day. Prepare now for warm sunny show days. Bring a Cool Mat, and if there is going to be an outlet bring a rotating fan. 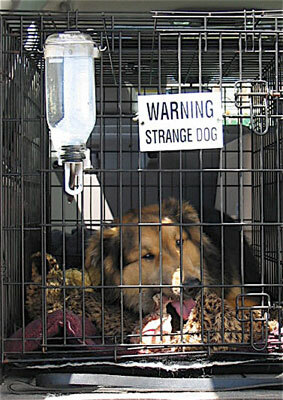 Attach a water bottle to his crate. Purchase a battery-operated fan that clips onto his kennel and keeps the air moving. (Note: never leave a traditional fan blowing directly on your dog for any length of time in the crate. 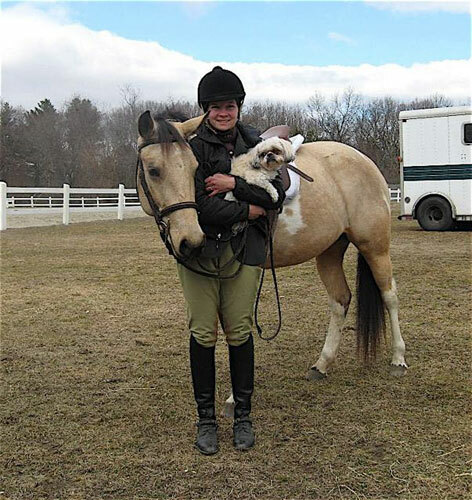 Even if you’re equally dog-and-horse-crazy, you need to be realistic about your show agenda. How much time will you have to actually enjoy your dog at the show? Unless you’re lucky enough to have a groom, you may have a lead-shank in your hand most of the day, making it next to impossible (talk about crazy!) to hold onto your dog too. Now is the time to start looking for dog “nannies” (dog-loving friends who can keep an eye on your dog while you are busy schooling and showing). Your dog will be happier and you’ll decrease your chances of him being bored, wandering off, or worse, getting stolen (yes, unattended dogs have been stolen at horse shows before). Plus, nannies are much more fun than crates, tethers, x-pens or sitting in the truck with the windows cracked all day. On a related topic, double-check your dog’s collar or harness to be sure it’s in good condition and fits well. While you’re at it, make sure your ID tags are attached, current and include your cell phone number. If she is not yet microchipped, now is the time to make an appointment. 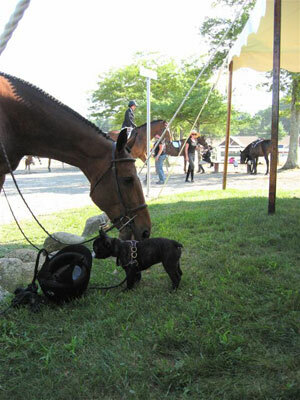 Dogs occasionally get loose at horse shows and if yours does, you want to be sure he can find his way back to you. Horse show mornings start early. Set your alarm even earlier so you can take your dog for a quick pre-show run. If he can trot on the treadmill, save time and let him stretch his legs indoors, as you are getting ready to go. Remember, a tired dog is more relaxed, more respectful, and less prone to stress. Don’t feed your dog a full breakfast. Instead, take some for the road and bring a yummy “dessert” with you. The extra dog food can be used to reward your dog throughout the day for good behavior. A raw knuckle bone, bully stick or other long-term chew will keep your dog occupied for hours and help him stay content should he need to spend time on a tether, in a crate or in an exercise pen. Be sure to bring your 6-foot leash and use it. Loose dogs are a liability and so are long lines and retractable leashes. Dogs and their long leashes can get tangled in humans’ and horses’ legs and give the dog enough freedom to run and potentially spook a horse. And even if your dog IS on a leash, be respectful. Never approach a horse you don’t know. Not all horses are dog-proof so why risk everyone’s safety? Take your crate out of the truck in the morning before the day warms up and put it in nearby shade. If you are at an overnight event, put it under the tent or even in the tack room where it doesn’t stick out in the open should your dog need to go in it. Keep a full water bowl handy and be sure to replace warm water with cool fresh water regularly. Dogs release heat from their mouths so providing adequate fresh cool water is essential for keeping them comfortable. No matter how happy your dog is to see his human friends, never allow him to jump on anyone, especially a rider in show apparel. There’s nothing worse than muddy paw prints on clean britches just before a class. Grrrrrrrrrrrrr! Always be a courteous owner and pick up after your dog. No one wants to step in dog waste, especially in expensive show boots! Be aware of what your dog is doing at the end of the leash, too. Lifting his leg on a exhibitors’ tack trunks, tall boots, grooming tote and saddles momentarily propped up against a trailer have all been witnessed. If you plan to leave your dog in the care of your “dog nannies,” be sure to pass along the specific show instructions outlined in this section. Make sure they know they are to keep your dog a safe distance from the show rings, warm-up rings, and in-gates, or pick him up if close to those areas. Oh, and don’t forget to tell them to always hold the leash, offer water frequently, and make sure to leave them with plenty of clean-up bags, too! As you’re making your decision whether or not to bring your pooch along for the big day, it’s important to look at each show individually and try to set him up for success at each one. After all, you want to have a good day, you want your dog to enjoy his day and you don’t want to be a hindrance to other dogs, riders, spectators or horses. There’s a lot riding on your actions and your dog’s behavior with potentially serious consequences for missteps. There will always be a few people who don’t enjoy dogs as much as you do (or at all) and would prefer that none ever be allowed at horse shows. This is all the more reason for you to set a good example with your dog! While I don’t agree with a ban, I think we can all agree that safety should be the priority and is a responsibility for all of us. 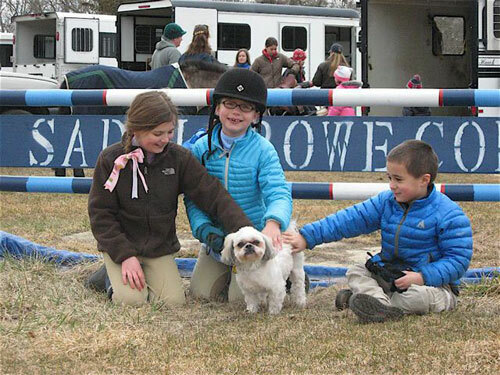 I may be biased, but I believe that with training, adherence to rules, tolerance and respect, dogs and horses can harmoniously coexist —at home, at the barn and at the horse show. 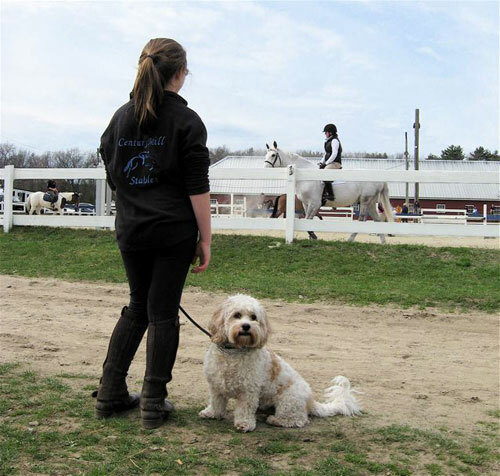 With a little preparation, your dog can be the star of the show, leaving you and your horse to take home the ribbons AND the admiration of your fellow exhibitors, dog owners and show staff. Good luck to all, and happy training! 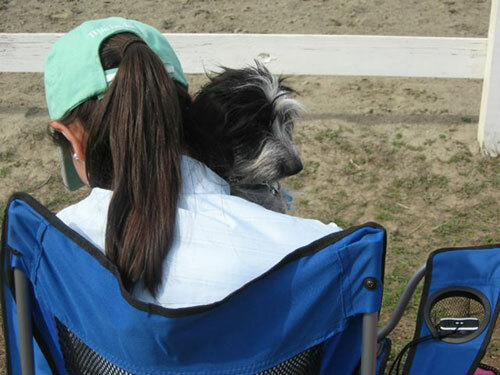 In case you missed it, also check out our Pak’s Picks for a Happy Horse Show with Your Dog blog. I think it depends…nothing is a one size fits all. Dogs are great at show as long as they pass the tests mentioned above. It can be a long day for all and requires good planning for horses and dogs.